Steve and I just got back from a BRILLIANT tour up in The Borders and Cumbria. 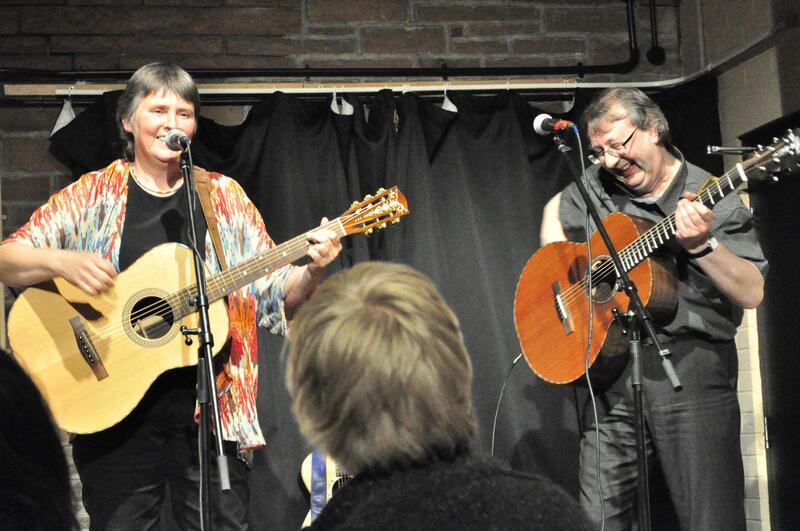 We were made to feel very welcome on our first visit to Kelso Folk and Live Music Club on Friday – thanks to Petshop Pete, David and Andy on sound. Early on Saturday we dashed across to Brampton ready to perform at Maddy Prior’s Stepping Stones Festival. Met LOTS of old friends and made a few new ones too. We SOOOO enjoyed doing our set on Saturday evening – many thanks to Gareth and … aaargh, can’t remember his name ..sorry, for the superb sound set up – then Steve did a guitar workshop on Sunday am. MEGA thanks to Maddy, who is a star in so many ways other than the obvious, and the team including Nette, Tim all the volunteers and of course my other family, the Barnstoners. Had to leave before the end of the festival because we had a gig doing the season finale at ‘Plug and Play’ at Penrith Playhouse – WHAT a fantastic place to play! Great crowd there; lots of young ‘uns and lots of up and coming talent too. Huge thanks to Tom Chris and Phil. Steve and I are shattered, but warm with the memories of meeting so many lovely people. THANKS for all your support and for all the lovely comments and feedback along the way. This entry was posted in Uncategorized and tagged Goulbourn, Hicks, Kelso Folk and Live Music Club, Penrith, Plug and Play, Stepping Stones Festival, Steve_Hicks_and_Lynn_Goulbourn by admin. Bookmark the permalink.